The sport fishery for Pacific halibut has undergone substantial change over the last several decades. Sport fishing regulations were not established until 1973. 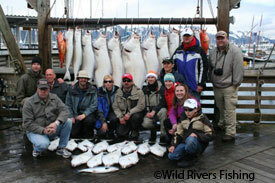 In 1975, the statewide sport harvest of halibut was estimated to be about 10,000 fish and there were few charter boats. By 2007, the sport harvest had grown to over 580,000 fish, with about 60 percent of the harvest taken by anglers fishing on charter boats. As the sport fishery has grown, the commercial halibut fishery has also undergone changes in management from a derby-style fishery with short openings to an individual fishery quota (IFQ) based management, which began in 1995. These changes coincided and resulted in an allocation conflict over halibut between the sport charter and commercial fishing interests. Because of this conflict, two big changes for the charter fishery are right on the horizon. Before describing these changes, it is important to understand the major players who make decisions regarding the halibut fishery. The International Pacific Halibut Commission (IPHC), created by a treaty between the United States and Canada in 1923, conducts research and management to provide for optimum yield of halibut. Decisions of the IPHC are crafted with input from commercial fishing and processing, and charter industry representatives. The North Pacific Fishery Management Council, created in 1975, is responsible for allocating the halibut resource off Alaska among various stakeholders (user groups). The council is made up of government and stakeholder representatives, and meetings are open to the public. The IPHC and the council submit recommendations that must ultimately be approved by the Secretary of Commerce. The National Marine Fisheries Service is primarily responsible for enforcing regulations. Although the State of Alaska lacks management authority for halibut, the Commissioner of Fish and Game (or designee) is a voting member of the council, Fish and Game staff monitors the sport harvest, and Alaska State Troopers assist with enforcement. A little history is also in order. The commercial and charter fisheries have been wrangling over halibut allocation since 1993. The conflict began when commercial stakeholders asked for a cap on charter harvest, the fastest growing segment of the sport fishery. The problem was that charter harvest was deducted “off the top” of each year’s allowable fishery removals before setting the commercial catch limit, which amounted to a de facto allocation of fish to the charter fishery. Growth in charter harvest had to be offset by a lowering of the commercial catch limit. The council struggled with the allocation issue for years before adopting guideline harvest levels, or GHLs, for the charter fishery in the fall of 2003. The GHLs were meant to serve as benchmarks for an acceptable level of charter harvest, and were set to allow for 25% growth over the 1995-1999 average level. 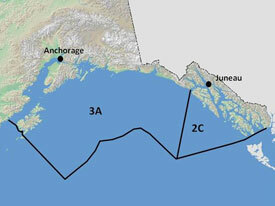 The GHLs were structured, however, to decrease with declines in the abundance of halibut. By the time the GHLs were implemented in 2004, charter harvest had grown more than 25% in Area 2C, Southeast Alaska south of Cape Spencer. The Area 2C charter harvest exceeded the GHL in the first year. Meanwhile, the IPHC was revising their stock assessment procedure, resulting in large declines in the estimate of halibut abundance. The GHLs were lowered, and the council took action and regulations were implemented to reduce charter harvest in Area 2C starting in 2007. The council could not respond quickly enough with management measures, however, and the Area 2C charter harvest exceeded the GHL every year since inception. Charter anglers in Southeast have been restricted to a one-fish bag limit since 2009. Meanwhile, charter harvest in Area 3A (Cape Spencer to Kodiak Island) slightly exceeded the GHL in 2004-2007, but the overages were relatively minor and no action was taken by the council to restrict harvest in this area. Soon after the council adopted GHLs, it passed a motion to incorporate the charter fleet into the IFQ system already used to manage the commercial fleet. The IFQ system was intended to replace GHL management, but IFQs never came to pass. Instead, the council rescinded the IFQ decision in December of 2005. The council then decided to consider a suite of options, including a limit on the number of charter vessels and a program to allocate halibut between the sport charter and commercial users. At this point, the Council put the charter industry on notice that operators choosing to enter the fishery after December 9, 2005 might not be included if a limited access system were to be developed. International Pacific Halibut Commission Regulatory areas included in halibut allocation. Finally, we come to the two big changes in store for the charter halibut fishery. First, the council adopted a limited entry program for the charter fleets in areas 2C and 3A in March of 2007. The Secretary of Commerce approved the program and the National Marine Fisheries Service began accepting applications for permits in 2010. Permits are issued to businesses that documented bottomfishing effort in ADF&G logbooks in 2004 or 2005, and 2008. Permits will be transferable or non-transferable, depending on the documented number of trips taken. The program also provides for a limited number of permits to be issued to selected eligible communities in areas 2C and 3A. All permits include limits on the number of anglers that can keep halibut, called angler endorsements. The rules for determining angler endorsements went through some last-minute changes in 2010. If all goes as planned, starting in 2011 anglers fishing on charter vessels may not retain halibut unless the business operating the vessel possesses a federal charter halibut permit. Halibut allocation is clearly a complicated matter. What effects will limited entry and the Catch Sharing Plan have on the fisheries? No one can be sure, but for starters, there will likely be a reduction in the number of charter vessels available to take people fishing for halibut. A recent NMFS analysis estimated that at least 30% fewer vessels than were operating in 2008 will get halibut permits. Businesses that entered the fishery after 2005 will have to buy permits in order for their clients to keep halibut. Some ineligible businesses may instead choose to target salmon and other state managed species. The Catch Sharing Plan will stabilize the allocation of halibut between the commercial and charter sectors, and charter regulations will be set before the season starts and will not change inseason. Other possible effects of the plan are not known. As the smaller charter fleet approaches full capacity, charter prices may rise and anglers may have fewer choices when it comes to planning trips. The Catch Sharing Plan was intended to be an interim solution to the allocation conflict between the commercial and charter sectors. The council also has long term plans to develop a permanent solution to this conflict. While no one is sure what that solution will look like, several ideas put forth include some form of compensated transfer of commercial quota share to the charter sector. Scott Meyer is the statewide halibut and bottomfish coordinator for the Division of Sport Fish and is based in Homer.